Of some concern is the news that this Antarctic expedition season has started off as the worst one on history as far as the weather is concerned. I'm told by the weather experts here, that this is the other side of Global Warming, and for Antarctica what this means is more frequent fronts coming through, and with them significantly more snowfall than 'normal'. Apparently the snowfall at the Pole is the highest its been for many years, and so contrary to what many would think Global Warming is increasing the ice cap in many parts of Antarctica. So how does this all affect me flying to Antarctica...? The Wedell Sea, and where the warmer ocean temperatures are causing more moist air and snowstorms. You can see the extent of the Ronne Ice Shelf (the lighter blue, and where it meets the Wedell Sea. The darker blue is the continent of Antarctica. the land, and you can also see Berkner Island in the middle of the ice shelf . I'll be starting at a point just off the map at the end of the southern end of The Foundation Ice Stream which is shown as the piece extending off the bottom of the map. 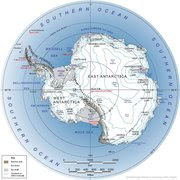 Flying from Punta Arenas to Antarctica is not just a regular flight.....: Firstly, the flight is some 4 and ¼ hours long, and it crosses the Drake Passage, probably the most inhospitable piece of ocean in the world. 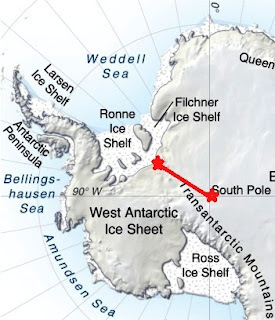 On crossing the passage, the flight goes down the Antarctic Peninsula, passing over Shako Island, before coming to Antarctica ‘proper’ and then landing on the Blue Ice runway at Union Glacier basecamp. The landing is 100% visual without the aid of instruments, and this is where the weather issues play a huge role. Essentially the decision to fly from Punta Arenas is only made one there is a virtually guaranteed weather forecast situation of good visibility, and wind of less than 35 knots for on the ground at Union Glacier some four or five hours into the future. The weather prediction is pretty sophisticated, but so it the weather these days...! This makes for some challenging decions by ALE management and the pilot captain. If on arrival at Union Glacer, landing is not possible, huge costs and risk is involved in having to return as a nonstop 9 hour flight, so these decisions are not taken lightly. 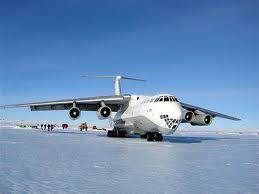 There are currently two flights scheduled before the one that will take me and Richard's group to Antarctica. The currently problem is the unprecedented amount of snow on the runway. The snow storms and winds stopped a few days ago, but the snow dump was so severe it's providing a huge challenge to be removed. Snowblowers are used, and we are told that the guys on the ground are working as hard as they can to get the runway snow free and 'landable'. With a bit of luck the first flight out will leave within the next day, and so maybe from Saturday, we will be on standby ready to fly at the short warning call, that is the mark of being next in que. Love the details it is your ability to paint this kind of picture that allows me to feel as if I am actually going along with you.